Give yourself a more youthful appearance with the revolutionary Fractional laser technology also known as Pixel. This laser skin resurfacing procedure will gradually stimulate new cells to replace aged and photo-aged skin with little patient downtime. Fractional laser therapy is used to treat sun-damaged skin, acne scars, stretch marks, wrinkles and other aesthetic skin issues. For aged skin, laser skin resurfacing treatments can improve years of damage in as little as one quick treatment. 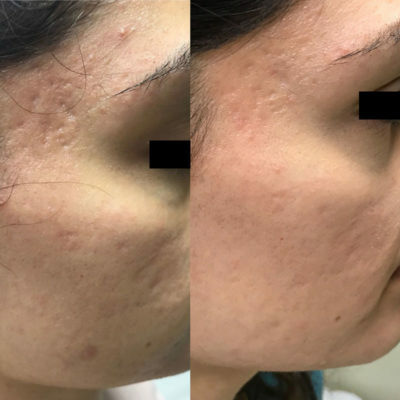 Patients who present acne scars, fine lines & wrinkles, irregular texture and even sun-induced “blotchiness” or redness can benefit from laser skin resurfacing. Fractional laser resurfacing removes layers of superficial skin tissue in a fractionated method. Preprogrammed laser energy is passed through the Pixel micro optics lens array and penetrates the skin, affecting average of 15-20 percent of the surface. It creates a micro-injury – without disturbing the surrounding tissue. Those micro-injured areas start the process of healing and the untreated area acts as a reservoir for rapid restoration. It reduces age spots, sun damage, acne scars, wrinkles, dull uneven skin tone and skin laxity. As collagen remodels a fresher, more youthful appearance develops! Significant improvement in the texture and tone of the skin. A natural glow is simulated. A reduction in wrinkles, scarring, sun damage, freckles and tighter skin. The skin will continue to improve for a period of 6 months following the procedure provided proper skincare is used and sun exposure is minimized. Significant improvement can be seen even in one treatment. However subsequent treatments are recommended for further improvements. The number of treatments recommended depends on the individuals skin issues, together with the age and lifestyle of the person. The friendly staff at Redeem Medispa will be able to recommend the course of treatment. Reasons for selecting Fractional laser? The effectiveness and safety of this procedure is high. Fractional laser therapy is a non-invasive treatment that delivers positive results with minimal side effects and complications. The procedure requires very little downtime, as the surface layer of skin heals much faster than it would after surgery where multiple layers of skin are damaged. Because it is non-surgical, the treatment itself does not take as long as cosmetic procedures involving surgery. Depending on the area being treated Fractional Laser treatments usually take about 45 minutes. Nearly anyone who has a skin problem can undergo fractional laser resurfacing. Discomfort during and after the treatment ranges from mild to moderate, depending upon the patient’s tolerance for pain. You might need an anesthetic applied to the skin, which would require extra preparation time. Fractional resurfacing is performed on an outpatient basis. You will go home straight after the treatment. Prior to the procedure, you must not use exfoliants containing ingredients AHA (alpha hydroxides) or glycolic acid. Your skin may tingle and feel hot, just as if you had sunburn. A cold compress on the area will relieve this uncomfortable feeling. The reddened skin will fade and “bronze” within 1-3 days. The treated skin will then turn into a dark crust that feels like sandpaper. Approximately 10 -14 days later, this top layer of damaged skin will fall off and allow new skin to come to the surface. During the healing period, apply sun block with a minimum SPF of 30+ at least 30 minutes before going out into the sun. Avoid scrubbing the laser-treated areas with any abrasive materials. Keep cool, because sweat on freshly treated skin will sting. It is best to wait to wear makeup until the 2nd day after treatment. If you must wear makeup, be sure the ingredients are as natural as possible. Do not swim in a chlorinated pool for 1 week following treatment. Do not pick at the damaged flaking skin. After the treated area has completely healed, patients usually notice that their skin is smooth and glowing. What Fractional Laser can do for you? During my early twenties I suffered from a horrible outbreak of cystic acne. Most of it consisted around my jawline, cheeks and temples. It hasn’t been until recently I started noticing that the scars left behind were getting increasingly noticeable.. particularly around my temples and the skin seemed to look “sunken” in. Part of it is due to aging and the other losing weight. The worst part that I felt was makeup made it look worse as after a few hours it would sink in and enhance them further. After my first fractional I noticed a minor improvement -lightening of these scars in terms of colour and only a mild softening. After my second fractional I noticed more smoother scaring however wanted to see more of a change with the skin around my temples..the change I could only see with pictures. I recently just had my third fractional and there is a huge difference! The scars are much lighter and look less hollow..the ones around my temples finally seem to be leveling out and overall my complexion is more brighter and even! Thank you. My skin B4 l came for the treatment was very pigmented and dark spots around my lips. After the treatment of microdermabrasion and fractional my skin looks great. My scars are light, the dark spots are diminishing slowly. I got so many compliments from my co-workers on how great my skin looks. I’m so glad l decided to go for the treatment. Thanks Redeem staff for making me look young and beautiful. They are great and very friendly. I will recommend them to all my friends and family. Come in for a free no obligation assessment to learn more about fractional treatments and if you are the right candidate to receive fractional.